Using the same techniques to enlarge the Lunar Jupiter II kit into the comicbook version, I’ve enlarged the Polar Lights J2 kit into a more realistic size (roughly in 1/72 scale 80′ x 24′), extending the outer rim from the original 12″ diameter to 16″. 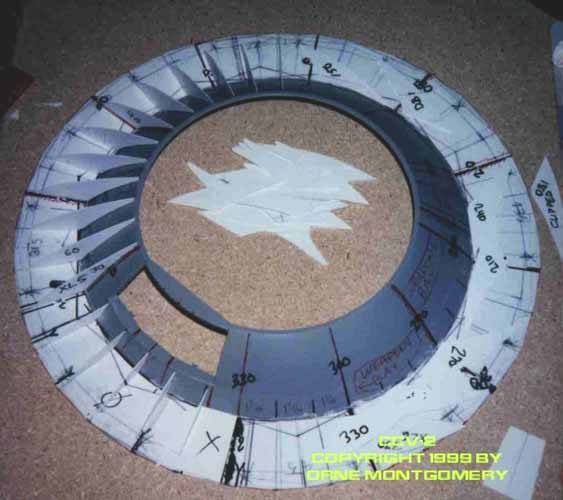 A rib framework was built over the plastic ring around the upper saucer’s rim, then sheeted between the ribs and sanded down to a smoother contour. I used Bondo UV sun-activated body-filler to finish the contour-work (UV works very fast when exposed to sunlight but is tacky when dry and gunks up sandpaper until the skin is roughed up). Scratchs, etc., were sealed with Bondo red glaze putty. 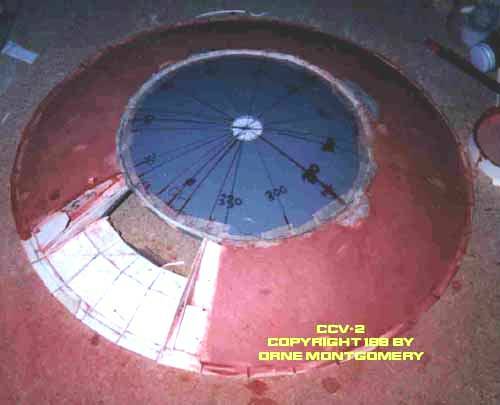 The lower saucer has only been laid up with ribs over the outer ring. I’m not using the the original undercarriage. Planning to borrow elements from the comicbook and movie Jupiter II, and rework the external features. While I’m also using the interior parts, these will be heavily-modified and extended outward. 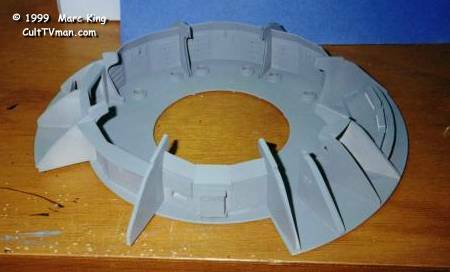 Bays will also be added for modified Chariot and SpacePod. and some other equipment. 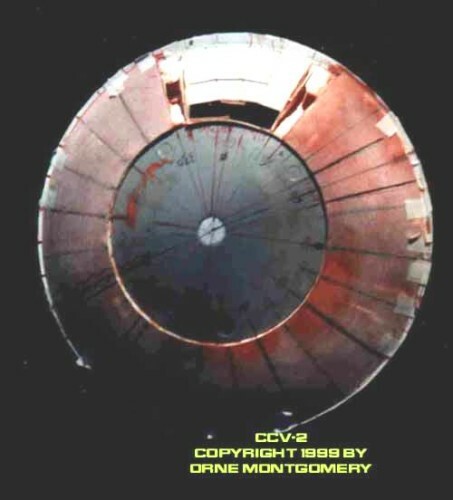 Going for the full treatment of how this ship (CCV-2/Centauri Colony Vehicle-02) would appear if actually constructed.